I was hesitant to fork over $40 for the directory but I did and it's only been a few days and already my music is accepted into 1 library and is in the process of being accepted into two more. I have only gone through a couple of the pages thusfar. Wow and thanks for the info!! Well worth the money. How To License Your Music.com's 2014 TV, Film And Video Game Music Business Directory is a comprehensive and up to date list of over 2,300 supervisors, publishers, music libraries, music departments, video game companies and ad agencies that are all in the business of licensing music. 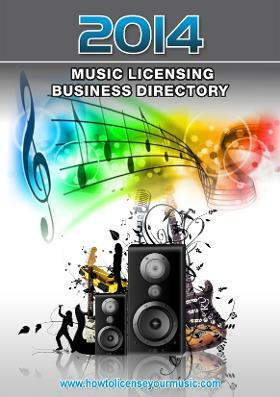 How To License Your Music.com's Music Licensing Business Directory is one of the industry's most respected directories for up to date contact information for professionals working in the business of music licensing. Published since 2007, the annual directory provides the most up to date and thorough contact information for music licensing industry professionals. Just $24.97 Until December 21st! Please note: The 2014 Music Licensing Business Directory is available as a PDF file. You'll be directed to the file immediately upon checkout. The 2015 Directory will be delivered via email on January 5th, 2015.